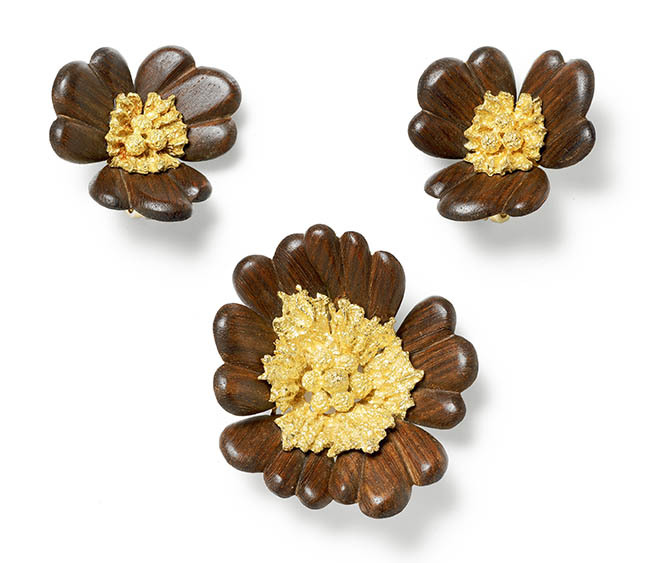 There is no greater source of inspiration to jewelry designers than nature. For hundreds of years the flowers in the garden have been recreated in gems and metal in innumerable variations. At The Adventurine, a week doesn’t go by without some form of bejeweled nature appearing in a post. In the last several days, the styles ranged from Christian Tse’s magnificent dandelion ring to the fantasy Tree Branch ear cuff and necklace Emma Watson wears in Beauty and the Beast. The Gardens presentation, that will be open until July 24, 2017, is multi-disciplinary. There are paintings, sculptures, photographs, drawings and films as well as jewelry in the show. The curators of Jardins emphasize that this is not a comprehensive study. And really, could there ever be of such a large topic? 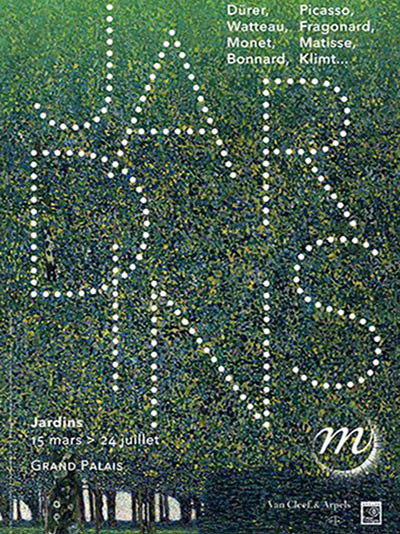 Nevertheless, Jardins is a beautiful. The curators were guided by the principle of the garden as an art form and its creators as artists. 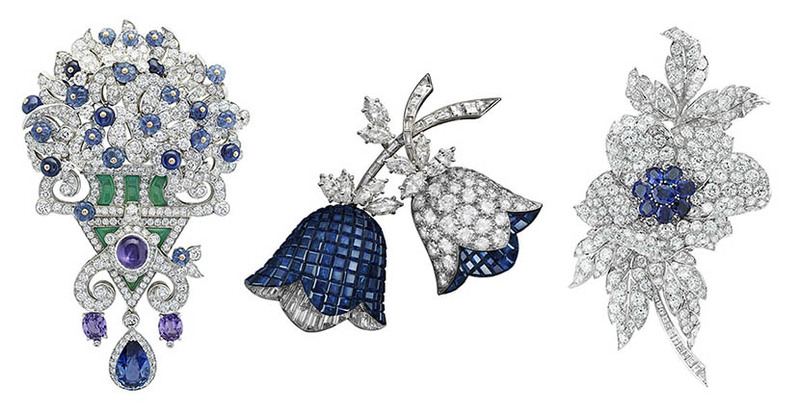 See several of the Cartier and Van Cleef & Arpels jewels in Jardins below. Overall, these designs pay homage to formal French garden styles. 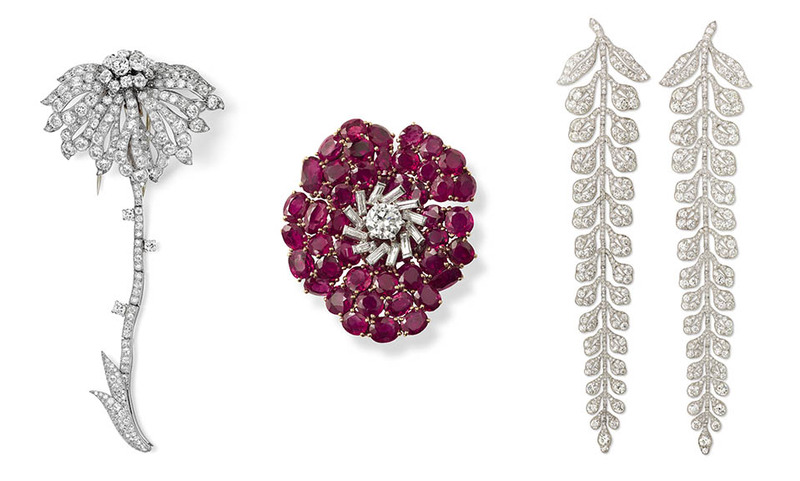 Three Cartier jewels: A special order diamond and platinum flower clip brooch made in 1941; A ruby, diamond, platinum and gold flower clip brooch made for the Rothschild family in 1938; Two diamond and platinum fern spray brooches made in 1903 for Edward Cassel. Two Van Cleef & Arpels mystery-set ruby and diamond jewels: The Three Leaves Clip, 1955 and Two Plumes Clip, 1956. 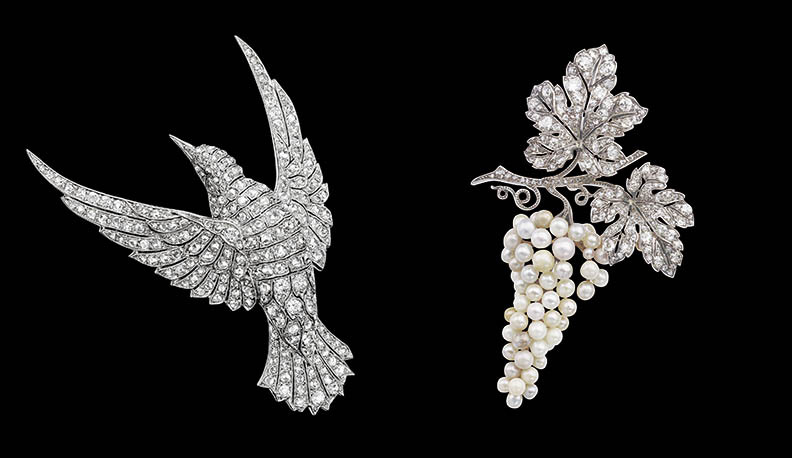 Two Van Cleef & Arpels Jewels: Diamond and platinum bird brooch, 1925; Pearl, diamond and white gold grapes brooch, 1915. 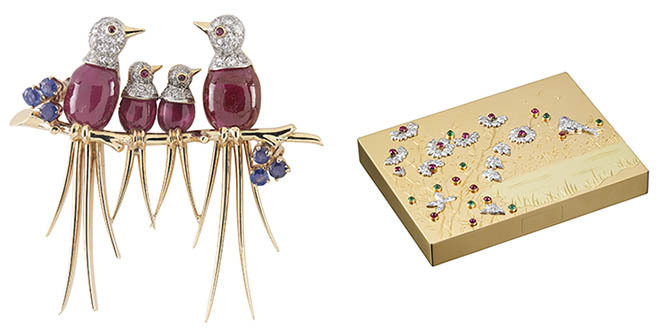 A ruby, sapphire, diamond, platinum and gold bird brooch made by Van Cleef & Arpels in 1946. A gold compact accented with ruby, emerald, diamond and platinum flowers, made by Van Cleef & Arpels in 1949. Three coral, diamond and gold jewels by Van Cleef & Arpels. The butterfly clip, made in 1975, also includes onyx accents. The Rose de Noel earclips and brooch were made in 1971 and 1970.